← What's the Festival Day Really Like? As in a great restaurant, sometimes presentation can be everything. 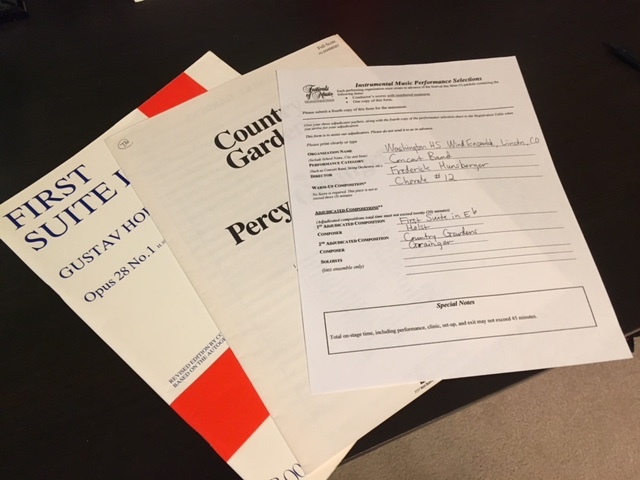 With your Festivals of Music experience approaching in about six weeks, now is a terrific time to make sure that you have everything that you need ready to present to the adjudicator-clinicians so that they may provide you and your students the best possible feedback on your performance. Key to this is the adjudicator’s packet, which you’ll turn in when you arrive at the check in desk on the day of the festival. If the piece is an e-print work, and you have printed out a copy of the score. Remember that you do have to actually purchase these scores individually—you are typically allowed one e-print per purchase. That’s why we’re letting you know about this six weeks before you need it—PLENTY of time to get on the phone or publisher website now to order those scores. Do that same exact thing two more times. Take the three manila envelopes with your scores and announcer sheet, and clip them together with the fourth announcer sheet copy on top. And you're ready for the registration table! Any more questions about assembling your packets? Email us here. See you soon! Part 4: It's Not Where....It's WHY. Performance Tour Philosophy.